Book Giveaway to My Wonderful Blog Readers! UPDATE: Thank you to all the entrants! The giveaway is now officially closed. Winners and their prizes will be announced soon. In appreciation for your kind support during my reading challenge last year, I’m giving away 2 novels and 4 nonfiction books from my Best of 2012 list (and one from my 2011 list) to lucky readers. The winners in each category will be selected at random from all valid comments via random.org. A valid comment includes answers to both questions, a way to contact the commenter via email or Twitter, and belongs to a U.S. resident who is 18 or older. No Bad Language will pay all costs associated with shipping and handling. Books will be dispatched to winners via the U.S. Postal Service at book rate, which may take up to 5 weeks for delivery. 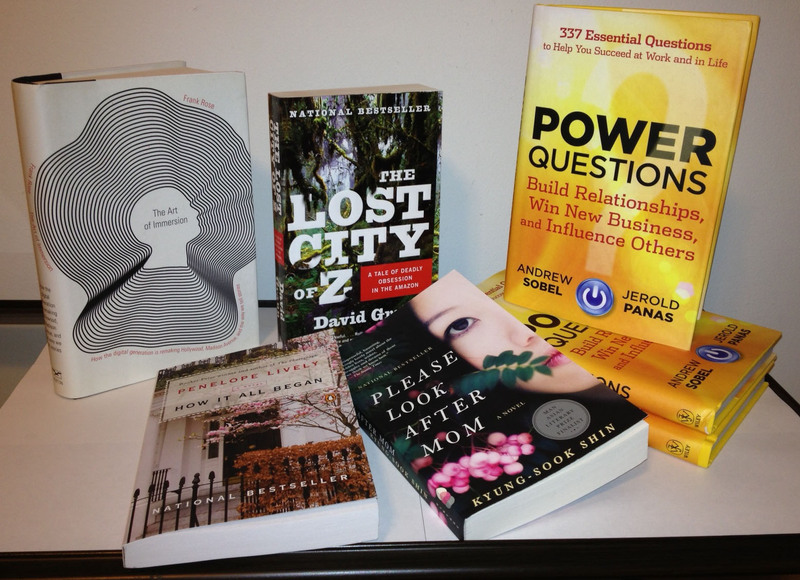 Copies of Power Questions were kindly donated by one of the authors and his publisher, John Wiley & Sons, Inc. The rest of these books were purchased by me as a way to say “Thank You” to you. There is no cost to you; the prize value of each is approximately $15 plus shipping and handling, all paid for by No Bad Language. Standard disclaimer: Some of these books may contain concepts, descriptions and/or language that could be considered mature in nature. All contents are the creation of the authors; this blog and its owner are not responsible for the material or points of view presented in these books. If you have questions, please leave a reply below, and I’ll respond as quickly as possible. Best of luck! Tell your friends! This entry was posted in Reading, Uncategorized and tagged book giveaway, giveaway by Vickie Bates. Bookmark the permalink. Favorite reads for 2012…David Meerman Scott’s “The New Rules of Marketing and PR: How to Use News Releases, Blogs, Podcasting, Viral Marketing, and Online Media to Reach Buyers Directly.” The other book I enjoyed reading was “The Entitlement Trap” by Richard and Linda Eyre. I just started reading “Talking Back to Facebook” by James Steyer; and believe it or not, I’ve never read Eat, Pray, Love by Elizabeth Gilbert. I need more fiction in my life. Thanks for your entry – so glad you made it! I loved reading the Steve Jobs biography by Walter Isaacson. As a longtime Apple fan, I’m fascinated by the company’s history and about Steve, himself. I’m a big non-fiction fan! Thank you, Vickie!! I think you are not alone in enjoying Mr. Isaacson’s biography of the late Steve Jobs! All the skunkworks by both Steves to create those first computers and then found Apple must be an intriguing read. Of course my favorite was The Swimming-Pool Library – for so many reasons. Hollinghurst’s writing transports you to an era many of us long forgot (pre-aids). With vivid clarity, his characters – the elderly Nantwich and the sassy (Schlampe) Beckwith – reflect a range of gay experience during that time framed by personal dispair and darkness with fleeting moments of joy. This amazing read reminds us of how far we’ve come despite the similarity of challenges faced today. I’m honored you’d pick a book I recommended and have loved since I first read it. Hollinghurst is an amazing writer and his first novel is so vividly established in time (early ’80s) and place (London) and poetic in the grace of its storytelling. Hi Vickie. My favorite 2012 book was “Quiet: The Power of Introverts in a World That Can’t Stop Talking,” by Susan Cain. It’s ideal for the 51/49% introvert/extrovert in me. (Myers Briggs). I would like to enter the drawing for the fiction group, preferably “How It All Began.” Thanks for this contest. I’m so glad you mentioned “Quiet” – I’d forgotten about it, and it’s one I absolutely want to read (being a classic “I,” too!). Thanks so much for your entry! My favorite book from 2012 was Rules of Civility by Amor Towles. It takes place in NYC in 1937-8 and is written in the flavor of The Great Gatsby…..I loved it! I would prefer to be entered to win a fiction book….but truth be told, I read almost anything! “Rules of Civility” sounds fascinating. I haven’t heard of Towles, I don’t think. I’ll add to my list – I love books about that time period. My 2012 didn’t include the impressive quantity or breadth of reading that your blog showcased but I have a favorite in both categories. In non-fiction, the very interesting and useful “You’re In Charge-Now What?” by Thomas J. Neff and James Citrin. It’s a thoughtful and organized way to approach any new assignment, with lots of lessons from business leaders (although relevant in the not-for-profit world as well.) For fiction, Deborah Crombie’s “No Mark Upon Her” grabbed my imagination and kept me fully engaged. I am eagerly awaiting the next in her Kincaid/James series of mysteries set in the UK. I am also eager for your reports from your reading in 2013. Your interests certainly helped broaden my own exploration. Happy reading! You and I share a love of UK mystery stories. Thanks so much for sharing Deborah Crombie – I’m going to look up her series. My favorite novel of 2012 was Liza Klaussmann’s “Tigers in Red Weather,” published last July by Little, Brown & Company. Klaussmann is related (remotely) to Herman Melville (so I read). This is a brilliantly-written coming of age novel, and much more. The choice was tough as 2012 seemed a great year for novels. Gosh, I’m learning about such great books from this contest. Thanks for sharing “Tigers in Red Weather” – I’m going to add it to my 2013 reading list. My favorite book of 2012 was one that I re-read, titled “Letters from Eden: A Year at Home, in the Woods” by Julie Zickefoose. The book came out in 2006. It chronicles, in drawings and essays, Julie’s walks throughout the seasons on her rural property in Ohio. Her drawings are the perfect accompaniment to her well-written prose. I’ll never be an an artist, but I do aspire to be as good a writer as Ms. Zickefoose! I also prefer to enter the non-fiction section! Thanks so much for your entry. And for introducing me to “Letters from Eden” – it sounds like an amazing book. My favorite book of 2012 was Gone Girl. I prefer the non-fiction section pretty please! Thanks for being the brave first entry. “Gone Girl” certainly was the novel of 2012 – tightly paced, surprises at every turn. What a great summer read! Thanks for sharing your fave of 2012.